In 2009 Pigtown Design and Easy and Elegant Life teamed up to raise awareness of the challenges faced by food banks across the nation in these challenging economic times. They called their mission April Food Day. 365 days later, the need is still great. People are still unemployed, underemployed, and financially overwhelmed. Food banks are a lifeline for a growing percentage of the population. It’s been a year since I wrote my post for AFD2009. In that time, The Mistah and I became intimately acquainted with the recession and unemployment. We looked for ways to save money. And honestly, one of the first things to get cut was the food budget. It was a challenge. It was psychologically bruising to go from grocery shopping at Harris Teeter, Safeway, and (sometimes) Wegman’s to food shopping at Target and Walmart. But when your income is cut by 60%, you do what you have to do. Feeding America is annually providing food to 37 million Americans, including 14 million children. Feeding America ‘s nationwide network of food banks is feeding 1 million more Americans each week than they did in 2006. If you are able to, I hope you will consider making a donation to Feeding America through the link that has been set up for April Food Day. Even if you can’t make a donation, I hope you will participate in AFD by spreading the word. Great post–great idea. I’m off to make my donation. 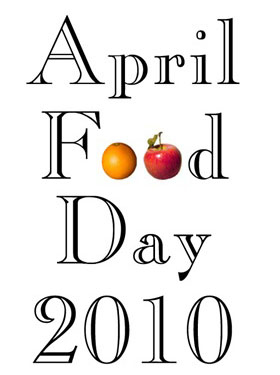 Wendi, thanks for supporting April Food Day. Kristin, thank you for sharing your LoveBombs with the community. I will say that the budget cuts forced me to think about how we spend our money…do we need it or do we just want it…and to be mindful of how easy it is to be wasteful.